We love our CRD remodel! 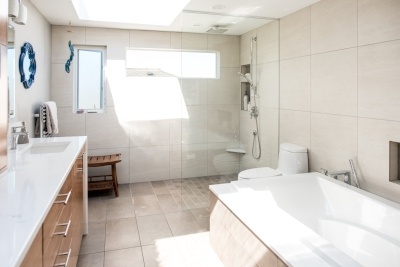 We converted a spare area of the basement to an ADU, converted a carport to a garage with new interior access, and remodeled the master bath into a beautiful Zen-like spa. We’ve lived with our new spaces now for six months and it is an awesome lifestyle upgrade. At the beginning of the process CRD designers proposed great ideas and at the same time were very open to our suggestions. The production plan was detailed, meticulous and all went pretty much on schedule. The builders were professional, timely, efficient, and at the same time receptive to our preferences and able to adjust on the fly to accommodate them. Work spaces were kept tidy and disruption was minimal. That says a lot given that construction occurred in three different parts of the home. Our house was originally built in 1940 so invariably some issues with how the house was constructed were uncovered. CRD staff found ingenious solutions to problems. Denny Conner, managers, designers, front office, our onsite carpenter and the various sub-contractors were all easy to communicate with and very talented. We loved their team approach. They listened! We couldn’t be happier with how the project turned out.